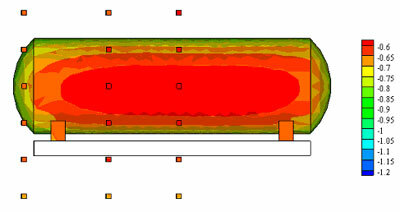 ..: Case Studies - Simulation of a CP System for a Buried Tank with a Steel/concrete Foundation:.. The CP level of a buried tank (or pipe) can be influenced to a considerable extend by a neighbouring steel reinforced concrete foundation, if the latter is connected electrically to the CP system. Depending on geometrical parameters such as the distance between the tank and the foundation, far field potential, soil resistivity etc., the CP level of the tank can drop far below the minimum required value (e.g. – 850 mV vs Cu-Cu sulphate reference electrode). 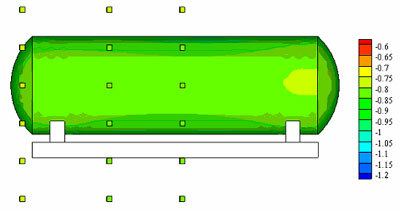 A typical situation is plotted in figure 1, the tank being only a few meters away from the foundation. The CP levels over the tank surface as computed by Elsyca CP-Master are plotted for the side facing the far field in figure 2, and for the foundation side in figure 3. The CP level at the foundation side drops locally to about – 600 mV (hence severely underprotected), whereas the far field side remains well protected. 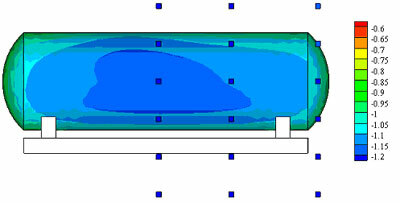 A plastic screen being positioned between the coated tank and the foundation has a clear and beneficial influence on the CP level of the tank surface facing the foundation (figure 5), improving local CP levels by about 200 mV. The far field side of the tank is still well protected (figure 4), with only a small improvement in CP levels compared to the situation without screens. 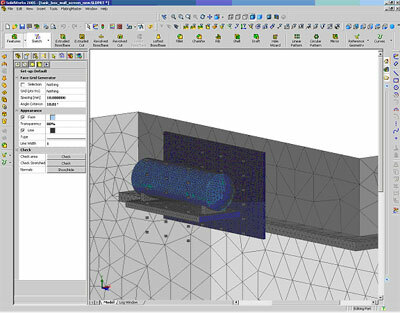 Defining the configuration from figure 1 in the SolidWorks CAD environment takes only a couple of hours, with another 10 minutes to compute the CP level over the tank surface with Elsyca CP-Master. Redefining the screen (position, size) takes only a few minutes, hence the screen configuration can be optimized easily within half a day time. Also the definition and simulation of additional screens and/or anode beds would take only a few minutes.